Botanical illustration is a wonderful meeting point for art and science. Ever since people have been studying ferns and fronds, they’ve found unusual ways of showcasing delicate, nostalgic flowers — exploring a different kind of rapport with nature. 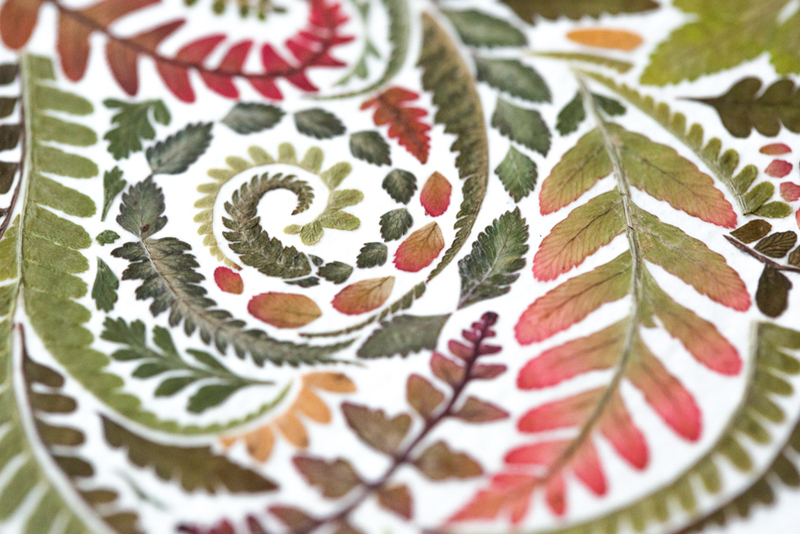 Helen Ahpornsiri is a UK-based artist and illustrator who creates incredible pressed fern illustrations from her studio in the East Sussex countryside. Although much of her patterns delights and surprises the viewer, there are some that are quite unexpected — a host of honeybees, an explosion of owls, penguins, storks and dragonflies. 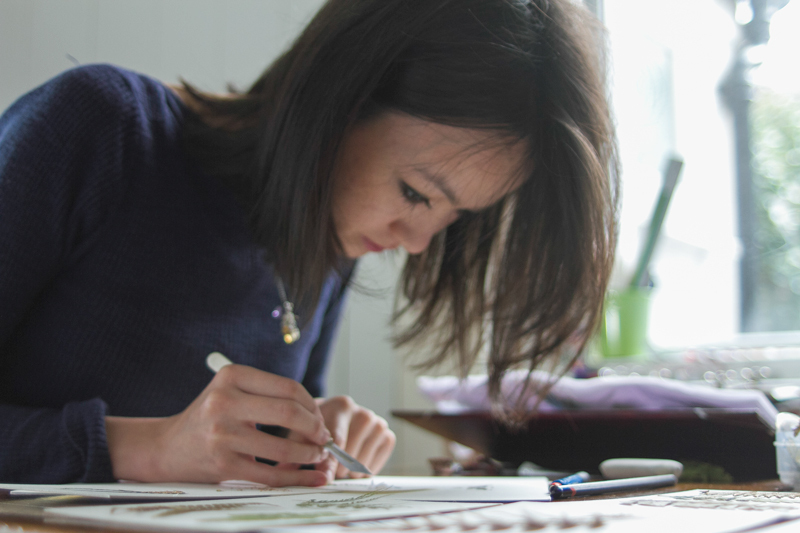 Ahpornsiri’s work is far from the academic botanical art of the 19th century, and explores the pressing of flowers and plants to create intricate illustrations that are no larger than a coin. She recently collaborated with Indian label Pankaj & Nidhi and her prints are now part of their Spring/Summer 2017 collection. When did you start working on botanical illustrations? How did the idea come about? 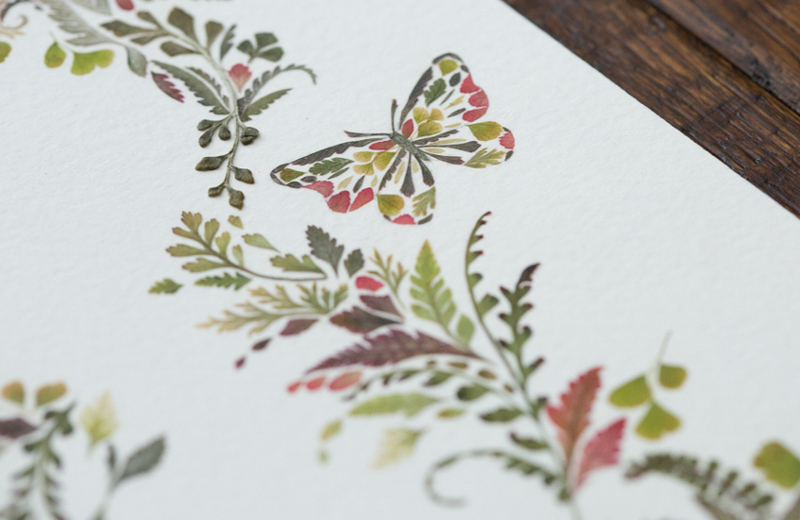 I began working with pressed plants to create illustrations three to four years ago. I had made a single experimental image of an insect using a pressed fern and found that the process and outcome was a perfect combination of my interests in natural history, craft and illustration. I begin by picking fresh flowers and foliage, and carefully place them in flower presses where they are flattened and preserved. They remain here for around six weeks depending on the species. 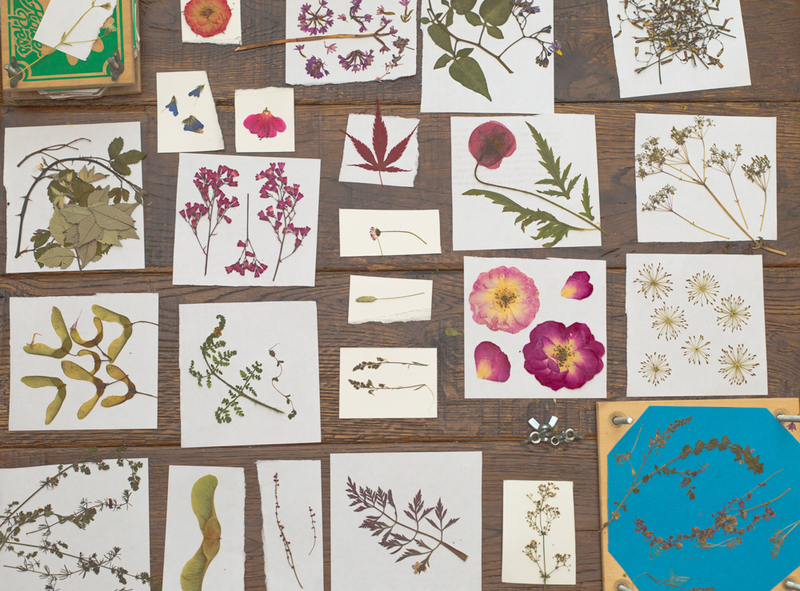 When fully dry, the pressed plants are organised by colour or species, and are ready to be used in artworks. I look at the designs as a three-part negotiation: the image the plants will be forming (whether it’s based on an animal, insect or something abstract), the patterns I want to create, and the natural form of the plant itself. All contribute evenly, and through this I strive to create pictures that are both structured and fluid. How many days does it take to press a plant and convert it into an illustration? After sitting for one to six weeks in a flower press, the final illustration takes a further few weeks depending on the size. My works are mainly small, but very detailed — some illustrations are just one or two inches in size and take a couple of days. The larger ones are generally not more than 10 inches and can take a month to complete. The fragility of pressed plants. I have to work very patiently and carefully as it is easy to break, fold or simply lose a petal, especially if it is just a few millimeters in size. This challenge is also largely why I enjoy working with the medium. Where you source your plants from? Are there only specific species that you use? The plants I use are mainly from my garden; or responsibly foraged around the woodlands, meadows and even roadsides of the East Sussex countryside. I mainly use fern in my work, foraging native species and growing non-native ones, although I am more frequently beginning to use flowering plants. Which are some of your most popular illustrations? My most well-received works are those that are based on classic countryside animals such as hares, birds, bees, butterflies and other insects. These creatures often live among the plants I use, forming an important connection. Tell us about your recent collaboration with Indian label Pankaj & Nidhi. Pankaj contacted me after seeing my work on Instagram. We discussed possible ideas and soon I was sketching patterns. My favourite piece from the spring summer 17 collection is the Barbados dress. 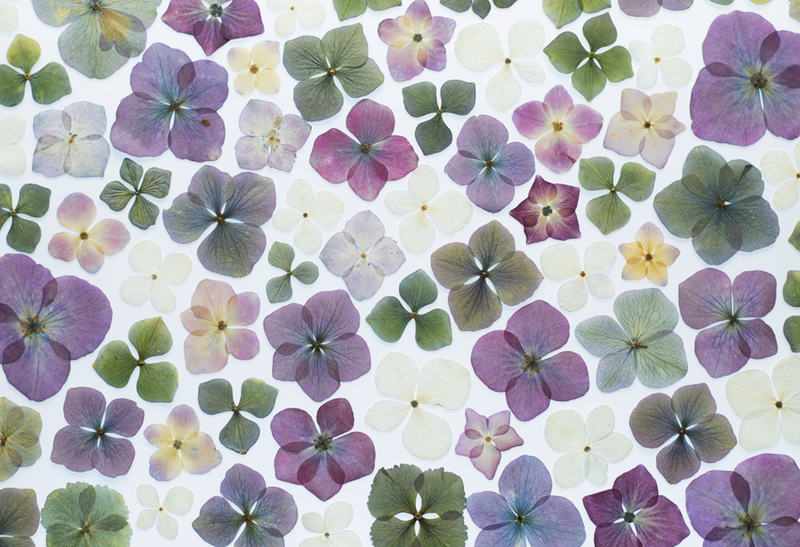 The print is a simple, bright and effective pattern made using pressed hydrangeas from my garden. I still remember picking and pressing them, and now they are part of a wonderful silk dress which is so exciting to me! I always enjoy opening the flower presses, especially when I have been waiting for a month or more. 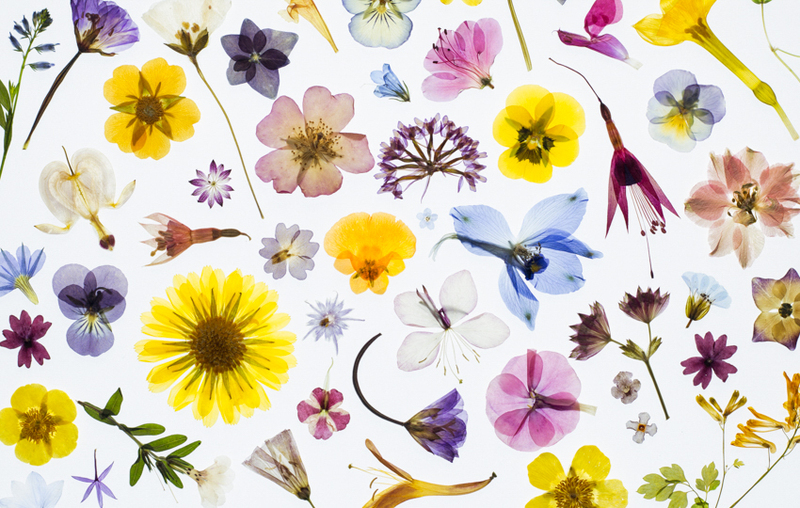 Many plants only bloom for a short time in the year, and flowers preserved in the press then become souvenirs from a past moment. Who are the artists and illustrators you look up to? I take a lot of inspiration from natural history collections and illustrations, so the work of Ernst Haeckel is important to me. His artworks are extremely detailed, beautiful and educational. I also enjoy the works of artist Joseph Cornell who gave meaning to seemingly pedestrian objects.